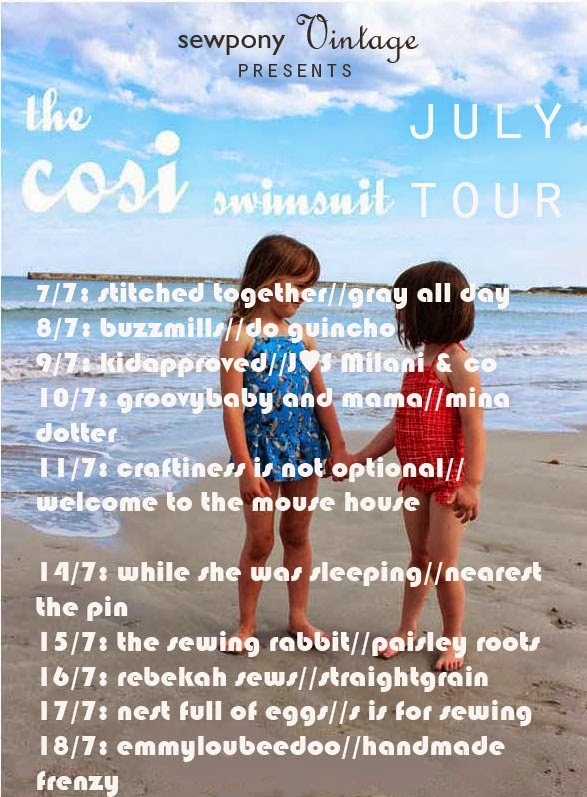 I have loved seeing so many gorgeous cosi swimsuits over the past couple of weeks. It is really exciting too to hear that for most people, it has been the first swimsuit they have ever sewn. Today's guests are Jessica from Me Sew Crazy/The Sewing Rabbit and Karly from Paisley Roots. Jessica is a busy mother to three girls and has a very busy blog - The Sewing Rabbit, where she showcases her own sewing and tutorials and also guest tutorials and inspiration from the "The Sewing Rabbit" team. Jess is also a big believer in creating community amongst sewers/bloggers and organises "girls nights out" across the US. Such a great idea! She also writes the quarterly online kids fashion/sewing magazine "stylo" with Celina. Jess is BUSY! Take a look around on her blog for so much inspiration! She made a one and two piece cosi for two of her daughters - I love the yellow!! You can see Jess' cosis here. Thank you so much Jess! Karly writes the blog, Paisley Roots. She has five children whom she loves to sew for. Karly won Season 9 of Project Run and Play. I am only a new follower to Karly's blog and am glad to have connected with her. She has also created a popular sewing pattern - the saffron twirl dress. Karly was one of my invaluable pattern testers - she made the blue and green suit you can see below. For my tour, she sewed up two more cosis! I love the look of all of them- the pink one in particular I just love! You can see Karly's gorgeous cosis here. Thank you so much Jess and Karly!! You can buy my pattern here. You can use the code: COSITOUR15 to receive 15% off at checkout. This applies to all of my patterns until Friday 18th July. Please come back tomorrow to see what Rebecca and An have made!